Farmers’ markets have been a moving fixture in my life –long before its welcomed rejuvenation and craze of today. Different variants of farmers’ markets and their local goodies punctuate my past and present, as a customer and visitor. 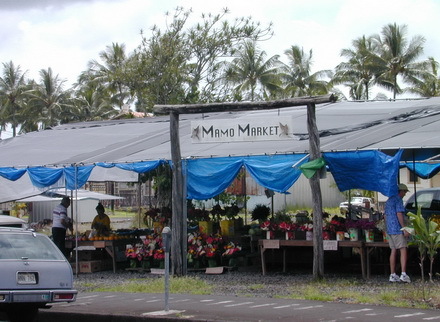 Market at Hilo, Big Hawaii Island 2002. Photo by HJEH Becker. Bike trip stop including cheap, huge papayas. Gorgeous stalks of tropical flowers were inexpensive and plentiful. It started off with ritual weekly visits as a teenager, with my mother to the Kitchener Farmers’ Market in Ontario. I plodded behind her and helped her carry bags or pull along the shopping cart buggy, while we weaved among the crowds and stands of vegetables, fruits, German sausages, and Mennonite shoo-fly and apple pies. I didn’t discover the famed Waterloo Farmers’ Market where black-clad Old Order Mennonites sold their wares, until I was in my late teens. It was over 20 kms. north and my parents didn’t have a car in those earlier years. Then we boarded the local transit bus, with our overflowing, heavy shopping buggy. After all, it was stuffed with cheap cuts of chicken necks, pork hocks and seasonal produce to feed a family of 6 children. Through the eyes of a disgruntled teenager, this earthy shopping experience by using buses, was far from a chic outing with a wicker basket, to meet a 100-km. diet menu. It certainly wasn’t about buying artisan bread, sans fats and sugar. It was about hauling enough butternut squash –at a cheap 25 cents each because squash didn’t have the foodie chic cache and popularity, as it does today. 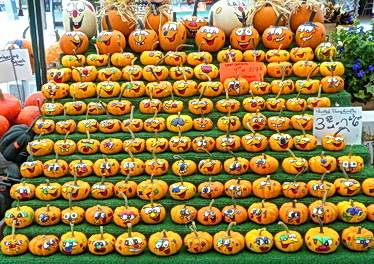 I was bored when we shopped at the farmers’ market. It felt uncool. Unfashionable people seemed to frequent the farmers’ market. I assumed this was another daily typical market experienced by every Canadian. It never occurred to me, a farmers’ market could be a tourist destination. How wrong I was. While living and studying at university in London (Ontario), when it was still strongly WASP, I quickly learned there was no farmers’ market in town at that time. Nor did everyone knew anything about the Mennonites. Nor were there sausages, ham and sauerkraut in great abundance in stores. Here, I was even more bored with local food choices and ambience. Asian groceries had not even penetrated any grocery stores. On B.C. 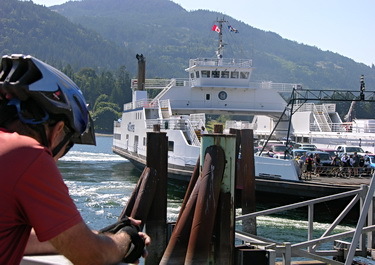 ferry to Saltspring Island and eventually to farmers' and arts market. B.C. 2010. Photo by J. Chong. Getting there by bike, was part of the whole enjoyable experience of a day at the market. When I moved to Toronto, I initially visited the St. Lawrence Market every few months. It seemed remote since I still only used subway and bus. Why would I go there when I could get quality or a lot more interesting food choices in Chinatown, Kensington or High Park-Runnymede areas? what I was buying and hauling home. That weight of food had better be solid, good choices, worthy of vigorous cycling sweat and effort. I started to buy interesting breads with all natural ingredients. And lovely cheeses, strong and more rich in flavor– beyond typical cheddar cheese. Downstairs one could discover the diversity of rice at Rube’s where he had well over 20 varieties. Though I knew what to buy in Chinatown, the St. Lawrence Market conveniently supplemented the Asian grocery pantry, with a good sampling of its Old World European food items, under one roof. I could fill up on some Greek and Italian foodstuffs as well as bagels if I didn’t want to run in multiple directions west, north and east to large ethnic neighbourhood areas in the city. So I have cycled the paths and roads leading several times to the market in Peterborough, Ontario; the Atwater Market in Montreal (for lovely Quebec cheeses and pastries); Ottawa’s Byward Market downtown, fish-throwing antics at Pike’s Market in Seattle and the hordes thronging at Portland’s market by the grounds of its local university. We have cruised the market plaza in Santa Fe, New Mexico where we saw pottery and bundles of red dried chilies shining under the cold bright blue sky. There was no seafood in sight here. Farmers’ markets offers an inexpensive way to see local foods, crafts and meet locals who offer their food tips, even if it meant they want to sell a food goodie to you. At Hilo’s famers’ market on Big Hawaii Island, we drank in the bright explosions of fresh cut tropical flowers at ridiculously cheap prices. There were heavy-headed, red wild ginger flowers at $5.00 per stalk or less; bundles of birds-of-paradise flowers, mangos and scented, ripe huge papayas at 25 cents each. Of course, you could get local sushi stuffed with Spam meat or tuna poke — Hawaii’s version of ceviche where raw tuna is marinated and mixed with various spices and juices. 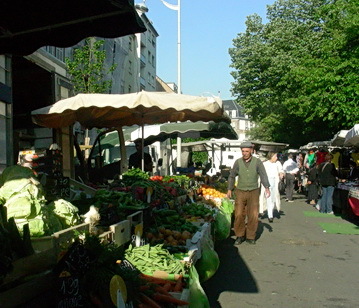 When I was in Paris on the Left Bank for several days, my sister and I stayed at a pension where at the doorstep, there was a neighbourhood morning market with an abundance of freshly baked bread, fruits and vegetables. Of course, we went to the famous Dutch cheese market at Gouda, in the Netherlands, where costumed teams of 2 cheese-bearers hauled around large orange cheese rounds on cradle flats hung from their shoulder straps. 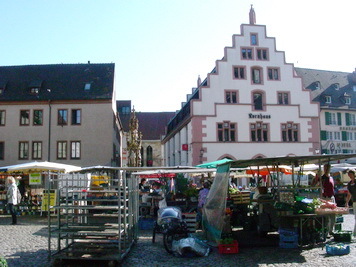 Earlier, I wrote about our recent visits this year to the Freiburg market in Germany or the Munsterplatz, under the shadow of a 700 year old cathedral and surrounded by carefully restored medieval and renaissance buildings. 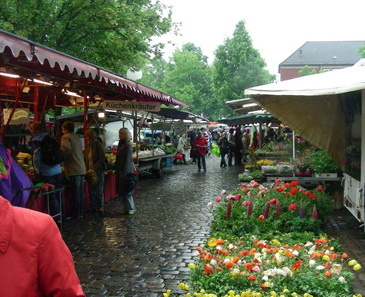 In Karlsruhe, Germany each day, we visited a farmers’ market a few metres away from our hotel. 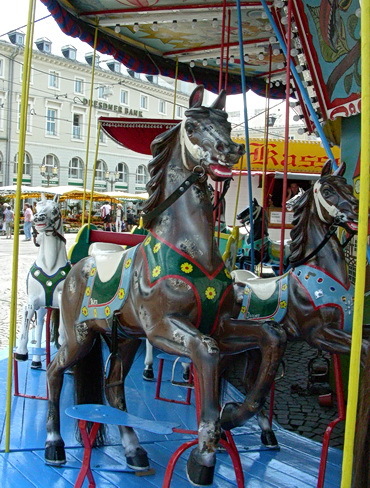 It was right in the heart of a major junction where there were streetcars, cyclists, shoppers, commuters, cafes and a local summer festival event that had a children’s carousel, stalls with German street food, candy and concert stage. Back in Vancouver, we cycled several times weekly, to Granville Market where unlike most other markets mentioned earlier, you could buy a wide range of local seafood year-round. This abundance plus its proximity to Japanese culture and history, accounts for Vancouver’s notoriety for the highest number of sushi and sashimi joints in Canada. 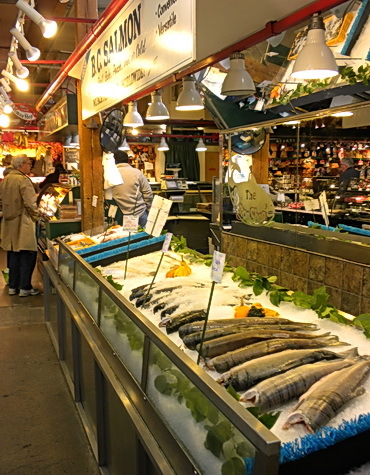 At this market, you need to be alert for short seasonal runs on salmon or for spotted shrimp. During summer, there are impressive piles of local blueberries and raspberries at competitive prices. British Columbia is Canada’s biggest raspberry producer. It’s always a careful balance to cycle back with a basket of ripe raspberries. For a change of pace to shop outdoors, we cycled to the seasonal markets set up at Trout Lake, the railway station, and Kitsilano. There, as well as at the popular Saturday farmers’ market on Saltspring Island, you were within view of distant mountains which truly marks a Northwest coast outdoor market experience. I don’t know how many other regions in Canada, a cyclist is pumping up the hill several times during the year, with bike panniers jammed with several fresh salmon over 3 feet long. 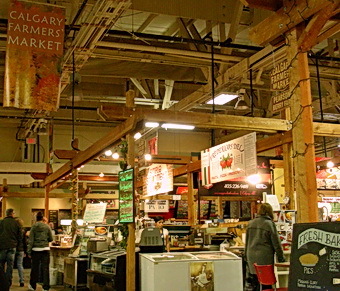 Local abundance of higher quality red meat, is apparent at Calgary’s farmers’ markets: there is no shortage of beef, either marbled or not, as well as several vendors of choice for bison, elk, and ostrich. A great reflection of ranchland Canada. But we also saw and hauled by bike, enormous globes of red beets and kohlrabi –twice or three times the regular size. One of the markets, Crossland Market, had various established Eastern European vendors with more Ukrainian and Hungarian food. They were joined by more recent fare from the Middle East, Mexico and India. So far it’s been a long, exploratory journey of farmers’ markets from teenage jaded boredom to now, as an interested consumer, spectator and visitor when we bike over to a market, find bike parking and settle down for coffee, local bakery pastry before stuffing our bike panniers with food from the stalls. 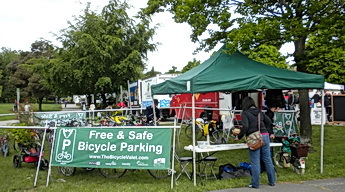 By now, Vancouver and in some major North American bike valet parking crept as an expectation for farmers’ markets. No longer are trees, rails or fences are satisfactory to park their precious steed. Some mainstream retailers seem to object to cycling facilities or bike parking gracing their storefronts, although cycling customers would be happy to spend some time buying and browsing. I used to live near the Atwater market where biking seemed more convenient. I never realized how farms and markets were underrated. I admit that comparing to grocery stores marketplaces include a cultural and human approach. I have been to a tiny market in Chinatown and I dont think they were farmers but I felt they knew their products and because the packaging was less formal it made the food look natural. 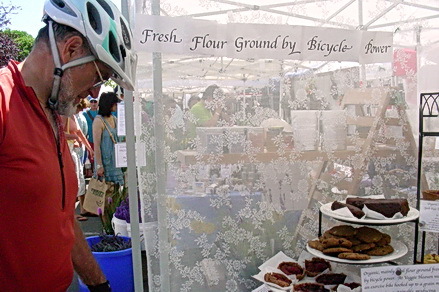 I’d loved to bike to BC’s farmers’ and arts market but I think I may need a plane to get there first. Your pictures are just great. Your mother was right for taking you to the market with her. You also sound like you travel a lot. 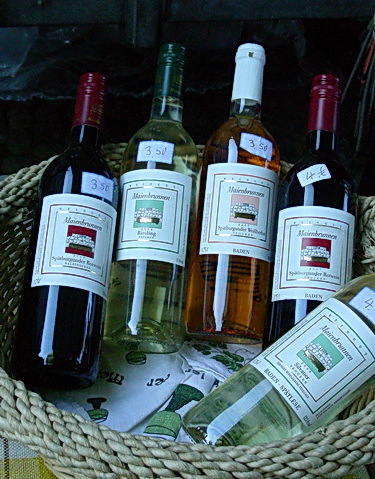 You would enjoy some of the markets in B.C. I should have added in photos of buying fresh seaweed at some of the farmers’ markets during certain times of the year. Sea asparagus (or otherwise known as glasswort), is short grassy like lichen that grows along the shore line in certain areas. Salty and great for flavouring with just a bit for a sandwich in lieu of capers or olives! We have a lovely market here in Prince George, BC. I’ve heard it’s one of the best in BC. It’s a great place to hang out with a bike. It now runs year round as it has an indoor venue. Maybe you can write up about the market experience up at your end one day. I haven’t been to Prince George yet but Jack, one of the firm’s principals for Third Wave Cycling Group, did join a group ride that went through Prince George and northward to Alaska. What a great idea for a post. I would love to go on a cycling trip and visit a different farmer’s market every day (it would have to be a densely populated area though…). I ride my bike to the market every Sunday. I get a bit of exercise and my baskets limit the amount of food I buy to just what we need and can finish off. Otherwise I might go crazy and pick everything in sight!